Manila, Philippines - The top 4 artists of 'The Voice Kids' were named on the results night of the top-rating and Twitter-trending vocal competion on Sunday, July 20, 2014 at the Newport Performing Arts, Theater, Resorts World Manila, Newport City, Pasay City. 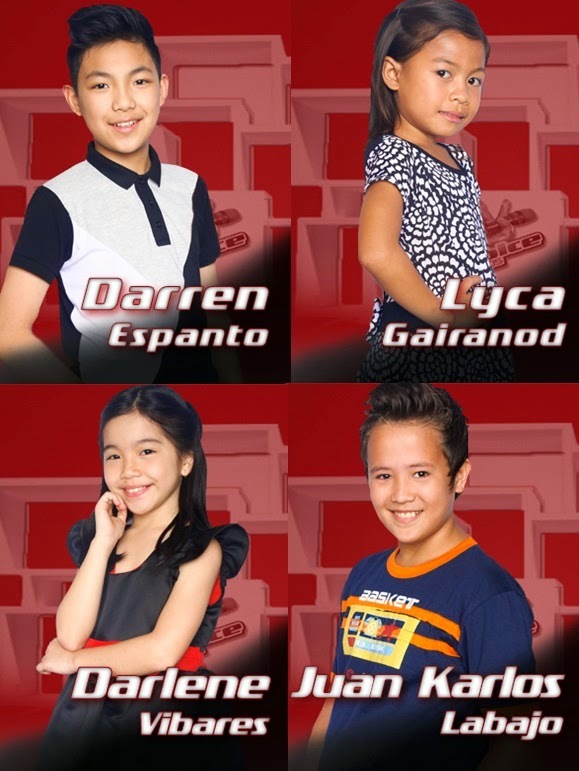 Young artists Lyca Gairanod, Darren Espanto, Juan Karlos Labajo and Darlene Vibares entered the Grand Finals scheduled on July 26. The last remaining contestants will battle it out for the title of winner of 'The Voice Kids' Philippines next week after other two singers were knocked out in tonight's live semi-finals. On Saturday, the top 6 artists performed a solo song, the basis of the viewers in picking the best artists in the penultimate stage of the competition. The selection of final four artists was based solely from the results of the public's votes. Team Sarah's Lyca and Darren managed to enter the final leg of the competition as they got high percentage of votes from home viewers. Team Lea has secured a slot with Darlene who will compete at the final round while Team Bamboo is headed by Juan Karlos. Team Lea's Ton-ton Cabiles and Team Bamboo's Edray Teodoro got the lowest percentage of votes. The three teams, together with their coaches, sang a medley of Francis Magalona's "Meron Akong Ano" and "Ito ang Gusto Ko" as opening production numbers of the results night. Alex Gonzaga and Gloc-9 performed Taylor Swift's "I Knew You Were Trouble. The episode of The Battles on Sunday tops online conversations with '#TVKSemiFinals', 'Darren For Top 4', '#TVKDarrenForTheWin', 'Go Alex', 'One Way Or Another' and '#Trouble' among the trending topics. Don’t miss the grand finale of “The Voice Kids” next Saturday at 6:45 PM and Sunday 7:30 PM on ABS-CBN’s Yes Weekend.